This story is the first part in a four-part series about our Halfsy Hero Korey Donahoo. Our series will follow Korey and three other heroes as they train for the 2017 Good Life Halfsy. Korey Donahoo has made it his life’s mission to cheer people on. 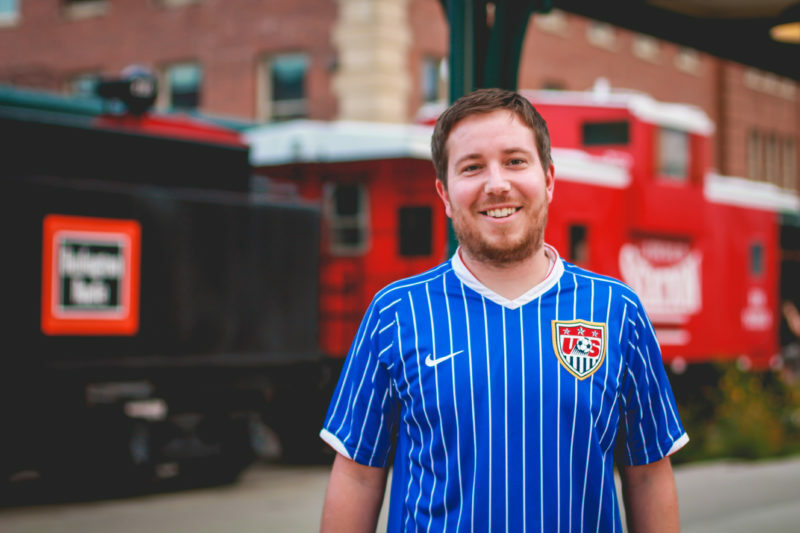 As one of the founding fathers of American Outlaws, (with his friend Justin Brunken) a non-profit group whose aim is to unify fans of United States National Soccer, he has made a career of igniting the spirit. He saw this spirit manifest last year when his sister decided to run the Good Life Halfsy. So Korey decided to give it a go. Tired or not, Korey was running with a purpose. Friends, family, coworkers, and total strangers were counting on him to finish, and so he did. “I don’t have a runner’s body. I was never a runner until March. Even now, I’m not a runner. Sometimes, it seems like my pace just gets slower and slower. But having people to be accountable to, having people counting on me to finish and earn this support, it makes it fun and meaningful. It makes me want to do better. Or ya know, at least finish.” he quipped. Check back for more Halfsy Hero stories, and to read the next installment of Korey’s story!